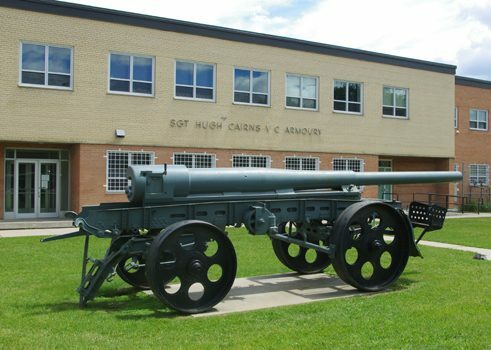 It was donated to the City of Saskatoon by the Canadian Government in 1919. Documentation from the Saskatoon City Archives reveals that in July 1920, the City Clerk asked the Director of War Trophies for some of these pieces to be sent to Saskatoon. Lieut. Col. A.G. Douglas replied and said that two guns were being shipped to Saskatoon. By 1927, this gun was located at the Saskatoon Exhibition grounds, and then in 1978 it was moved to the Armory on Idylwyld. The canon K16 | © Goethe-Institut Montreal The 15 cm K 16 was a heavy field gun used by Germany in World War I and World War II. Guns turned over to Belgium as reparations after World War I were taken into Wehrmacht - the unified armed forces of Germany from 1935 to 1945 and served after the conquest of Belgium as the 15 cm K 429(b). It generally was used on coast-defense duties during World War II. The designer of the canon was Friedrich Krupp AG, now known as ThyssenKrupp AG. It was one of Europe’s largest companies early in the 20th century. The company played an important role in the realm of weapon development and production during World War I and II. For 400 years Krupp flourished as the premier weapons manufacturer for Germany. From the start of the Thirty Years' War until the end of the Second World War, they manufactured everything from battleships, to U-boats, tanks, howitzers and guns, among many other things.